Mayer says, "We’ve added contextually relevant, left-hand navigation to the page. This new side panel highlights the most relevant search tools and refinements for your query. Over the past three years, we've launched Universal Search, the Search Options panel and Google Squared, and it’s those three technologies that power the left-hand panel." Update 4: According to Brad Stone with the New York Times Bits Blog, Google is rolling out the new SERP design gradually right now (Tuesday and Wednesday). Update 3: More people are reportedly seeing the new design today, assuming this isn't April Fools material. Update: Danny Sullivan reports that "slight variations" of this design are "live in the wild," and "still being shown to a randomly selected group of people," and that Google doesn't have an expected launch date for a complete roll-out. 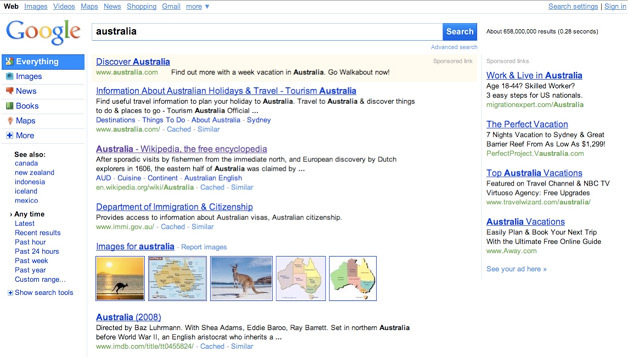 Original Article (11/19): Google is testing a new user interface for its search options feature. If you are unfamiliar with the search options feature, it is the link on your search results page that says "show options" and brings up a menu on the left-hand side of the screen providing a number of ways to filter your results. According to Danny Sullivan at Search Engine Land, a "small number" of Google users will see the new interface starting today. The aim of the new interface is to provide users with a cleaner display. Sullivan says that if the testing goes well, Google may roll it out after the New Year. He quotes Google's Marissa Mayer as saying, "We're basically looking at a new look and feel for Google. 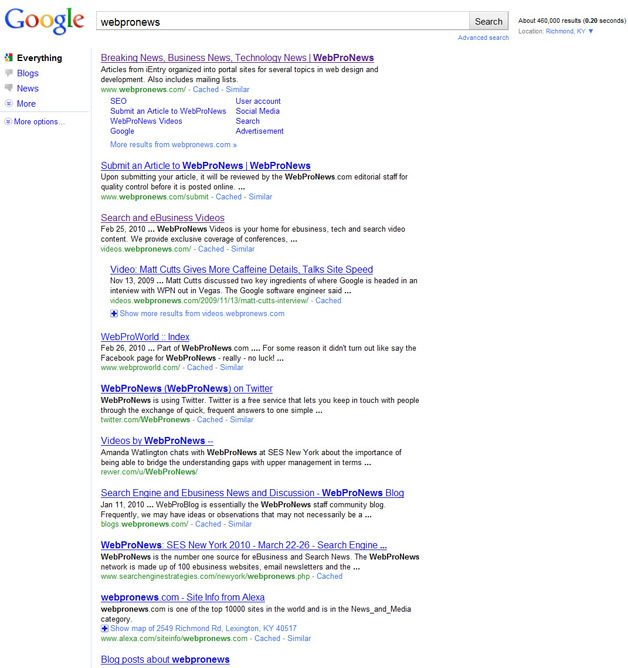 It's an overall cleaning up of the search engine results page." Of course, the Google's search options and Bing have been compared in the past (and other search engines utilize a similar design too for that matter), in terms of the general layout. Their functionalities differ on various levels. It's important to note that this will just be how the search results pages will look, without having to click the search options link to get to it. 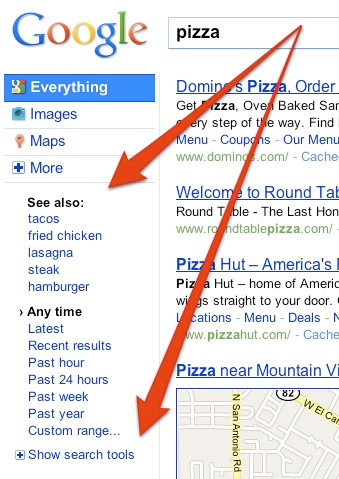 There has been discussion in the past about how much users actually use Google's search options, simply because the feature is easy to overlook. Such a change would put the options right in your face. Besides being visually different, the options themselves are different in some areas. For example, a "see also" section has been added, which suggests related queries. There is also a section called "show search tools," which now contains things like the Wonder Wheel, Timeline View, and "more shopping sites." Google may start messing around with the top navigation on search results pages next year, but the company has acknowledged that it works well right now. It will be interesting to see the change in use of this top navigation if the left-hand options go mainstream. Its great, Really Google added advanced feature to see the specific results which you want also add the sidewiki to write the comment for your sites.. Thanks for shearing, keep going..
Good writing. Keep up the good work. I just added your RSS feed my Google News Reader..I actually found it very thought provoking, thanks. Pocket sized rolex replica uk were definitely connected to the state run dress professionals who log in these days decide an individual for that trendy appearance. As soon as the period of time for pieces appeared to have reached any sunset with the dawn for these types of machines mainly because mobile phone tag heuer replica sale, islate laptops which unfortunately add a time-keeping equipment, pocket sized pieces require individuals by just delight using an freakish comeback. For a shrewd shopper anytime hublot replica sale arrives at pieces would mean recognizing looking for buys, having the capability to base looked on vendors for fashionable or simply comfort types, respected shops stocking collectible pieces, retail outlets going through chunky sporting events pieces together with other exceptional choices that has to be straightforward ignore -- not having an amount of due diligence. Initially, order him or her mainly with a looked on car dealer who's got a good irreversible hublot replica sale together with productive happen to be correctly functioning your online business seeing that a number of years. Have some clientele feed-back and show away certain critical reviews in the process. You might like to get hold of various hints in addition to a superior hublot replica uk could express most of the useful info related to those rugs.